One of our favorite things to do during the summer is giving away mountain bikes through our Bikes for Kids program. Inspired by attorney Chuck Boyk, from Toledo, Ohio, we started our version of the program in June 2016. Bikes for Kids aims to recognize children in our surrounding area who are doing good things for their family, friends or community. Each week, for 10 weeks from June to August, we choose one child to win a mountain bike, helmet and lock from Motorless Motion in downtown Mt. Pleasant. It is so heartwarming and inspiring to meet our winners and their families, and hear about all the amazing things they do. We share their stories in the newspaper, online and sometimes on television. You can read their stories here. During the spring and summer months, bicycle traffic picks up around Michigan. We wanted to offer some tips to keep you and your loved ones safe on the roads. The League of Michigan Bicyclists has a helpful guide, “What Every Michigan Bicyclist Must Know,” that “is meant to help bicyclists use Michigan’s roads and trails safely and enjoyably.” The guide begins with an illustration on what equipment is required for safe riding. 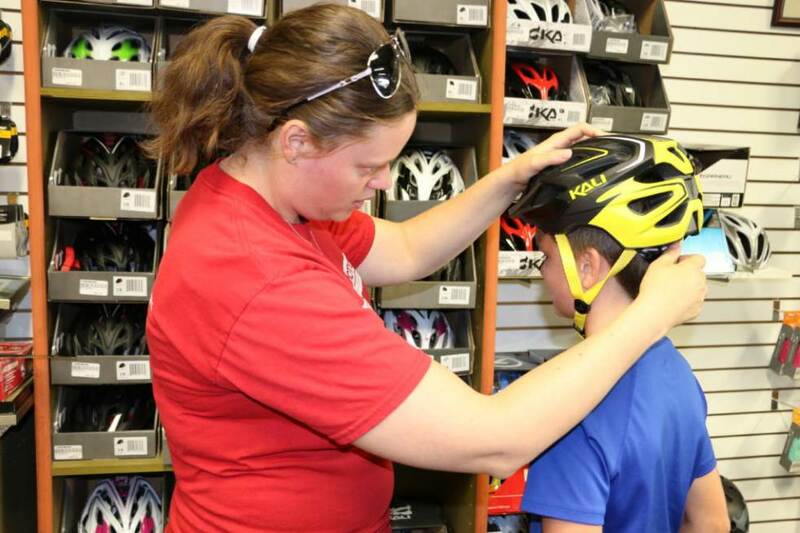 Allison Quast-Lents, owner of Motorless Motion, stresses the importance of wearing a helmet to the children who win bikes through our Bikes for Kids program. She helps them adjust their helmet and make sure they know how to wear it properly. She tells them the helmet does no good if you don’t use it every time you ride. The guide also suggests wearing brightly colored or reflective clothing, and bringing a water bottle, identification, a tire repair kit and a cell phone. A mirror, lock, protective eye wear and a bell are some other items you might want to consider. There are a wide variety of illustrations and graphics in the guide to make sure you understand the anatomy of your bike, the rules of the road, what to do before you ride, etc. A link to the full guide can be found here. Never ride against traffic (on the left side of the road). You may, however, ride with traffic in the far left lane on one-way streets. When stopping for a rest or emergency, move completely off the road and into the shoulder. At intersections, make eye contact with drivers. A simple head nod can help ensure they acknowledge your presence. Many railroad tracks cross roads diagonally. To prevent catching your tire in the track, especially under wet conditions, always cross at a right angle. When moving out into the travel lane, look behind you first, and signal your move to the left when clear.